At the risk of sounding like a woman twice my age, I must confess my unabashed love for crafting. It is a compulsion that has left no wall uncovered in my apartment and no weekend without a project. How I craft: lay out detailed plans, collect materials, stress over infinitesimal details, create, repeat. This past weekend I met up with two friends to catch up work on own respective projects. I have several craft projects in the hopper at the moment, so I finished up modge podging a lantern I was working on and began making pinwheel garland to accent a mirror in my bedroom. 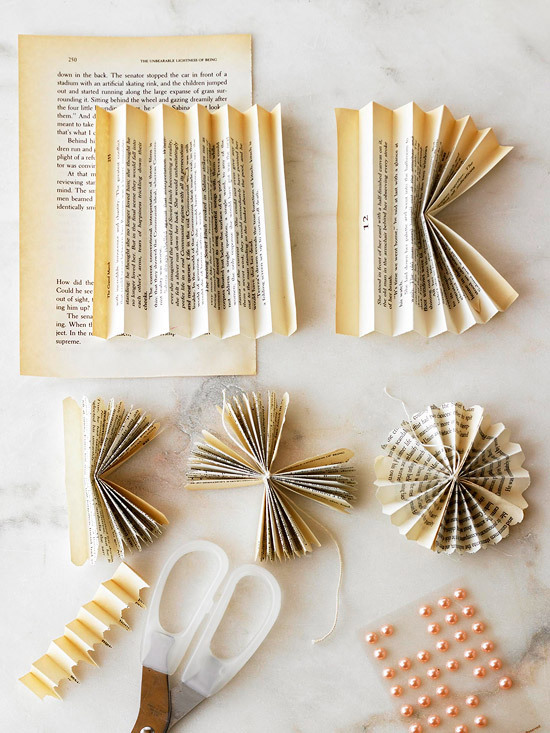 I love the look of old books in decor, so naturally I gravitated towards the idea of making a pinwheel out of book pages. To make a pinwheel, I folded two old book pages entirely in accordion style. 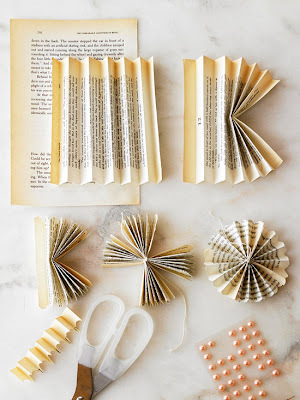 The older the book, the more character your pinwheel will have (however be careful with your paper choice, as some old pages tend to be too frail to fold). This example instructs to trim the ends to create a curve, but I preferred to leave the rough edges. Tie the two pages together and glue the ends to form a circle. I finished off the pinwheel by adding a gold center to cover the tied pages and strung the pinwheels on hemp string. Customize the pinwheel to your liking or add other components to this garland. I've since decided to update the garland by adding other textiles for balance and added texture.